The original Milo&Gabby’s animal-shaped pillowcases are sure to capture your little one’s heart and imagination! Made with ultra-soft 320-thread count sateen cotton, your child will have sweet dreams with this pillow friend by their side. Sized just right for your growing toddler, our pillowcase measures 20" x 27" and is compatible with our exclusive Milo&Gabby Pillow insert (sold separately). Our pillowcases coordinate with the entire line of Milo&Gabby comforters, blankets, security blankets, sleeping bags and even toddler backpacks. Easy to clean- simply unzip, remove the pillow, and toss the pillowcase in the washing machine. 100% Cotton. Imported. Recommended for ages 4 years and up. Imported. HIGH QUALITY MATERIALS - Made with ultra luxurious 320 thread count sateen cotton that is silky soft and cool to the touch and includes an easy to open zipper design to insure your pillow stays in place. Pillow insert sold separately. MACHINE WASHABLE - The Milo&Gabby animal shaped pillowcase is machine washable and easy to clean. Machine wash delicate cycle, cold water. Line dry recommended. Do not bleach. Do not dry clean. 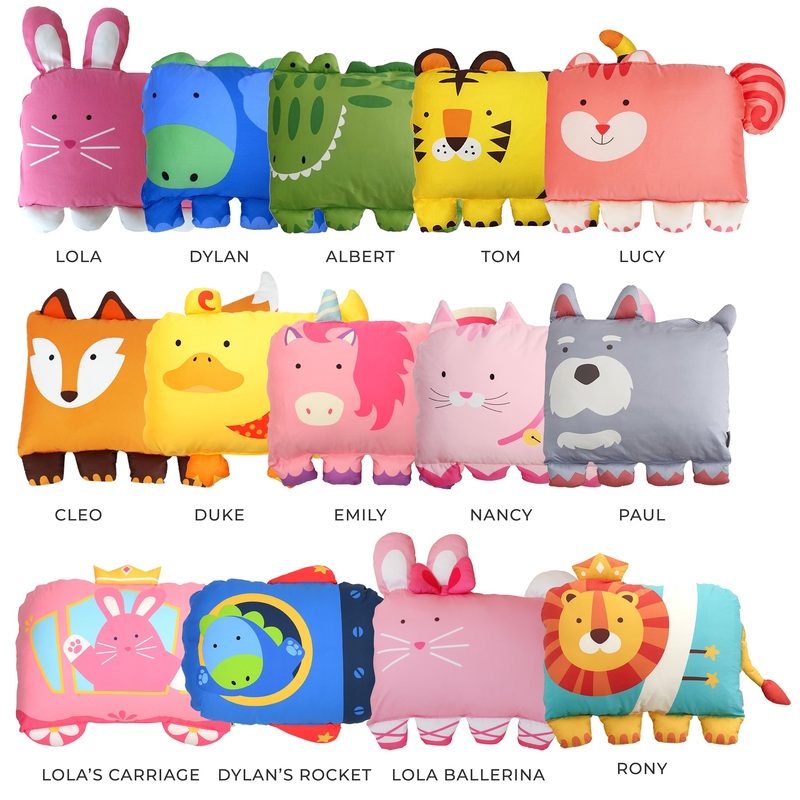 ADORABLE ANIMAL DESIGNS - Choose from our full line of charming Milo&Gabby animal characters: Albert the Alligator, Cleo the Fox, Duke the Duck, Dylan the Dinosaur, Emily the Unicorn, Holiday Reindeer, Lola the Bunny, Lola Ballerina, Lucy the Squirrel, Nancy the Kitty, Paul the Doggy, Rony the Lion, and Tom the Tiger. SIZED JUST RIGHT FOR KIDS - Our mini pillowcases, paired with our matching inserts, make a great "first big kid pillow" for children. Each pillow case is compatible with standard pillows measuring 20" x 28". Pillow sold separately. PAIR WITH OUR MILO&GABBY KIDS PILLOW - Our Animal pillow cases are compatible with our exclusive Milo&Gabby Kid's Pillow Insert, sold separately. Handwash in cold water. Do not nonchlorine bleach. Tumble dry on low heat; remove promptly. Warm iron as needed. Do not dry-clean. These pillowcases are perfect for the kids. My 10 year old and my 3 year old both love their pillow animals. I was impressed by the quality of the stitching and the hardware. The kids pillow insert is super soft. My 3 year old has always had an issue going to bed and this has made the transition to his own bed much easier. He loves snuggling with his lion at nap and bed time. I can’t wait to get the matching quilts for the boys Christmas. My girls are absolutely over the moon now that they've got their Emily the Unicorn and Dylan the Dino pillowcases . My oldest loves that she has a new favorite friend to snuggle with at night. The dino pillowcase gets tons of "Rawr!"s. Personally, I really like that this pillowcase fits standard sized pillows. I got this pillowcase for my 5 year old and 3 year old, and they love it! We got the adorable unicorn and the bunny. It's great because it zippers close so the pillow inside does not move around or fall out. It's soft and the perfect size. The design makes it fun to play with as well. This pillow case is so cute and a great size! It is playful and something she will have for a lot of years! Plus there are lots of different animals to choose from! My daughter loves having it in her Norwegian teepee for playtime! Can go with you wherever you go! Toddler Pillow Insert with Removable Filling, 12" x 20"